← A cup of what? I haven’t worked much with the Square of Mercury (bad witch … no cookie). But the other day I got het up about using the Square as a possible vehicle for a deeper contact with Hermes, upon whom I call before any form of divination. I suspect Hermes and Mercury may be the same god known by two different names (something I don’t assume is the case, when looking at gods of similar attributes from different cultures). A square of 8 lines of 8, with each row (vertical, horizontal and diagonal) adding up to 260. Agrippa wrote about it in the second of his three volunes, Of Occult Philosophy. 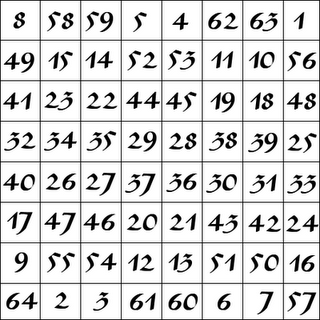 One of the many popular ways to use the Square is to ritually prepare one as a magical tool, and before any work requiring Mercury’s aid, let your eyes rest on each of the numbers in sequential order from 1 to 64. Unfortunately, in practice it’s quite cumbersome. Standing in the Square of Mercury, time dragged as I tried to locate the next number, and then the next, craning my head and turning about at each attempt. So I stepped off of the Square, and tried walking the pattern on the unmarked pavement, using the Square in front of me as a guide. That was better, but still pretty awkward. Then I had a notion — perhaps I could distill a pattern from the movements, and turn it into a dance. Back home and armed with pen, paper and a Square of Mercury, I began to unravel the sequence. I was both surprised and delighted by what I found. The same figure — perhaps a sigil? — repeats 8 times in the Square of 8 — four times in what I think of as an upright position, and four times facing downwards. Superimposed over the figures in the course of their being made are three crosses, each formed differently. I won’t include the shape of the figure here, in case some of you would rather not see the sigil hidden within the Square. If any of you would like to see it sketched out, email me, and I’ll send it to you. The crosses intrigue me. I keep bumping up against the practice of signing three crosses over something to magically seal it. It always felt like a Christian overlay to me, but I see now how the practice may be much older. For the first cross — up to down, then right to left. For the second cross — down to up, then left to right. In Thy Name I take up these cards. From a word to a word, let me be led to a word. *Adapted by a friend of mine from Paul Huson’s divination rhyme in Mastering Witchcraft. Sigil of Mercury by Trothwy is licensed under a Creative Commons Attribution-NonCommercial-ShareAlike 4.0 International License. Based on a work at https://usedkey.wordpress.com/2011/03/10/the-square-of-mercury-distilled/. Brother, it is common knowledge that Mercury is Hermes. One is Greek, the other Latin (Roman). The Romans conquered Greece and took their culture. Some differences exist, to be expected. But as an ancient astrologer, we use the original Greek names of the planets. We say “the star of Hermes”, not “Mercury”. This is because the names are not arbitrary. More than that, I cannot say. You may rejoice at reading Vettius Valen’s Anthology. Free translation is available online. Thanks for the heads up about Vettius Valen’s Anthology! I’ll check it out.